Well it's been very bust for me, but finally had a moment to sit down and type some, so it's better late then never. Three new ones this month, Bruges, Augustus, and Mascarade. With Elder Sign, Bohnanza and Lost Cities dropping off. IMHO, some games are good because others say they are good. And so get more play; "all these people are playing this game, let's play it". While other good games sit around with little notice because they aren't being talked about. So, a few years ago I decided to start looking at those games that are getting played a lot that AREN'T part of the top 200. You may ask why top 200 and not 100? Or for that matter 300? 'Because'. Although, I suppose if I was motivated, I'd really switch it to 500. IMO, if a lot of different people are playing a game, it must have some value to someone somewhere. That's not to say that the Top 200 AREN'T good games or there aren't games out there that are good that aren't getting any play. I'm just trying to show some games out there that different people are playing 'because they are fun' and not just because they have the best press. Over the past couple months, I've gotten a couple comments about 'well these are on BSW (or what not)'. To that I have to say "ah but you have heard of [them].." Again, I'm not saying there aren't MORE good games out there. I've also had a suggestion about adding weight to longer games. A complaint is that these are short (filler) games because people are more likely to play shorter games. Well, isn't that the point? 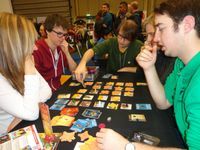 Showing some games that people in your group might be willing to play. Plus, I'm doing it on number of users playing it, not number of times. IMHO The length of a game does not measure enjoyment. 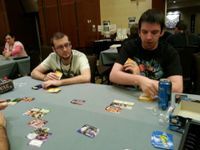 For my gaming tastes I get more enjoyment playing 3-6 different games in the same time the other table is playing one game of TI3. Obviously, expansions skew this. It's just going by how they were logged. So, if someone logged Niagara while others logged the game under spirits, it's just got Niagara. So, here's some 'good' press for games that may not be showing up on 'top lists'. 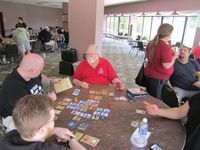 I'm allowing additions, but let's keep it to those games that are good (to your group), get played a lot on BGG (you decide), but aren't ranked in the Top 500. My HM are games that look interesting that just stay under these 10 or that I've played recently and are just outside the top 10. I've also added a Top500 HM and Top1000 HM. The most played (by different users, not number of times) that is ranked higher then 500 and 1000 and not on this list already. I had had a couple lists by weight, but since this is 100 eye balling manual through the game stats page, I've dropped those. I must say each month I had gone ahead and picked up a few games off of this list and for the most part have been VERY pleased. Most people in the group are buying the top games and I've been adding to the game library by adding these gems. The lone exception really was Poison. I some how thought there would be more to that game then counting to 13. Trains hits the number one spot. 1088 plays by 573 train-line builders. Dominion Railroad. Essentially takes Dominion mechanics and challenges you to build a rail network with it. Sure there are some cards like trains and buildings to give you card points but the bulk should come from building stations. I find the mechanics give meaning to the theme of the game more so than with Dominion. I like it but you're going to need to like Dominion and trains (60/40) to enjoy this one. I can see hy AEG picked this one up. I will be a money maker for them with expansion maps and additional card packs. The first game was very promising. 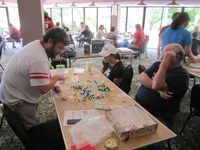 The board play felt like a perfect compliment and gave you enough options such that you weren't forced to pick a single path near the beginning of the game. It was hard to get the right balance of board emphasis, but I think that's just room to explore. One of these days, I'm going to try this. Since starting this list and now, I've bought it, just need to learn it now. In the mean time 571 people played it 1088 times. Quite enjoyable. Not really quite enough to strategize on, but it was fun to get new cards each round. Like unwrapping five fun treats. The dice were very well integrated as well. 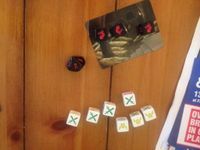 Look for the subtle trick of making the high value dice a really tough decision since they are also needed to eliminate threats. Again though, nothing really to differentiate from game to game that I saw (in the first game). I think he could have done away with the board however. Maybe just a canal card for each player to use. Impressed with first few plays of pasted-up German copy. Seems quite tricky to plan your four actions each turn given the constraints & resources needed. Still on my wishlist, but I'm debating whether to buy a reasonably-priced German edition (& do paste-ups) or pay over the odds for an English edition. Or maybe just skip it. Many fish in the sea. I realized halfway through rules explanation that I'd played this game before -- back in November 2012 when it was still a prototype. I even still have some notes regarding suggestions I made at the time! I disliked it at the time; the published version is certainly an improvement, but I still find it to be solidly lacking. What I find most interesting is that most of my major complaints with the prototype were actually addressed - just not as much as I would've hoped. The biggest remaining issue is the downtime; I realize this is also an issue in beloved games like Can't Stop, but it's certainly not a good thing. The original was excessively random, new version is slightly less so (but still very swingy). Your ability to push your luck was extremely limited, and now it's still limited but you have at least a few options. Relatedly, you had little room for finesse and the dungeon progression curve met a very sharp end point - this is again slightly improved. The original had no sense of progression, and now you have accumulated treasures and a level-up. So I guess it's nice to see that the published version is clearly improved and my feedback was assumedly taken to heart -- I just wish it was further polished to make it 'more' and offer more interesting decisions to players. Fun quick activity for when you are waiting for people to show or as a late night cap. Good replacement to 7 wonders. Bingo-flavoured Civ-lite. Pull a chit, then lucky players queue up to pick a new card. The more players there are, the more frequently these scoring phases happen, so there's a continual interruption to the game. I actually enjoy a few bingo-like games with the family, but this one just doesn't flow well enough. Forbidden Desert 859 plays by 425 would be survivors. Follow-up to Forbidden Island . . . now too much sand and not enough water is the problem . . .
Award(s): Mensa Select Winner (2013). Nice redevelopment of Forbidden Island. Similar, but different. Crazy themed simple filler that times it just right. And it has zombies which earns it an extra point from me. Zombie-Ninjas sound like fun, right? How about Robot-Dinosaurs, or Pirate-Wizards? 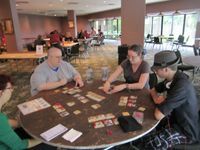 The concept is interesting as you try to blend the talents of 2 different geeky factions in order to conquer different geeky locations. When I read the rules I was psyched because it sounded light, fast and fun too. Unfortunately, when we played it didn't meet those expectations. While the rules are simple, the card effects and base effects just make things confusing. 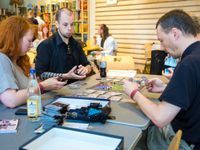 With a group of gamers this would probably all be second nature, but with non-gamers it quickly gets overwhelming (particularly because of the fact that different cards can be played at different moments in the game.) Then there's the constant adding up of cards and modifiers to check if locations are complete each turn. Finally, my OCD goes into overdrive with these games where there is no logical place to play all the cards. Ideally you want to read all the abilities/values of all the cards splayed off all 4 sides of all 4 bases, but this causes one row to run into another, and it just drives me batty. With all these little issues it just ends up being tedious rather than fun. If all the players had a level of familiarity with the cards it would flow, and be fast. I can see that potential in the system, but I'm not sure I have the right group to get there. Awesome game. Plays fast and is just purely fun. Don't play this game with the goal to win just play to have fun and make the most of your turns. Looks pretty good. A possible 9. Simple, but elegant and fun. I'm a sucker for quick and smart games (Samarkand, Oregon, Die Dolmengötter), and this seems to fit the bill pretty well. Works particularly well with two or three players. As far as fillers go, Kingdom Builder is not bad. The placement rules and variable victory conditions do provide some measure of interplay variability and tension, and it is interesting determining what the risk/rewards are for making certain placement choices. That being said, I like to have the opportunity for a very large number of plays in my filler games, and after about 20 plays you will see most everything that this game has to offer. Granted, there are a large number of possible combinations between cards and player boards, but these are not going to add new decisions to consider, and thus is not enough for me to want to play this further. Rating based on one play. Great fun, very full on. Played in Malta on a guys weekend. Played with Richard Ham. This is one game where my initial impression was proven (for the better) wrong. It's a good game for what it is and doesn't outlast its welcome. 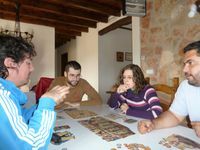 At a 10 minute game, it's easy to teach and fast to play but probably more fun with the right familiar crowd. It won't replace The Adventurers for me but still has its place as a party game. My rating might even go up with more plays and after adding the expansions. This is a great scaled-down version of Pandemic. But it's different enough to really feel like its own game. 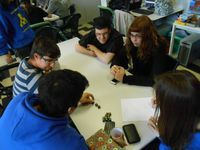 The components are really well done and the rules are simple and clear. It's very fast, making this a good warm-up or filler game anytime. The 4-player game is especially intense! What a perfect gateway game to pull out with any group! Well worth adding to our collection. Average game. Seen it all before in Pandemic. As our daughter said after our first game, "So, it's basically all luck." And, given that you pretty much know what needs to be done and just have to line up the recipients of the melds in the right order, hoping that no big whammy wipes you out before the plans play out, she's right. Pirates grabbing booty through the age-old medium of simultaneous card play. I enjoyed it, but no plans to buy a copy. I'm supposed to like this game more based on how it plays and the mechanics - but I keep trying it and I keep not really liking it. It has some definite lame duck potential (not a huge deal for a quick game, but still annoying) and I tend to feel like I have extremely little control. I also really dislike the uneven tiebreak distribution - for how important tiebreakers are, having some colors beat others 80% is ridiculous and unnecessary. Short, fast game of laying tiles to try and be the last man standing. Simple rules & minimal downtime make this a great choice for a quick filler or for playing with people who don't play games much. Tsuro is about the easiest game I've ever played. I doubt there is any sort of strategy at all. Mostly the game is all about luck. But it's a fun game to play and it only takes about 5 minutes. Not a bad starter game for game nights. I'm always on the lookout for new push-your-luck games, because that is one of my family's favorite mechanisms. I've been reading about this one for a long time, and it seemed like a good investment, so I made a point of buying it in a geeklist auction. 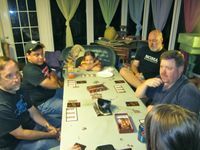 It is indeed an effective game for my family because the rules are straightforward, and it has a fair amount of those surprise moments when someone gets the unexpected roll of 3 brains or 3 gunshots. On the one hand I'm very glad that the game only plays until someone has 13 points, because these kind of games need to be fast and furious. However, on the other hand, with such a small goal it is easy for a player with a single lucky round to gain such an advantage that the victory is virtually out of reach for the other players. And it feels like that really good round is very hard to achieve and there is no way to directly affect your odds, so it's all about who hits that one magic turn. Still the game is decent fun, and doesn't outstay its welcome, so who really cares if I feel like I have no shot at winning for half the game. It's a solid dice filler, and might take some of the load away from Mmm ... Brains! which was our previous end-of-night game.